The study showed that 8 out of 10 kids choose to spend time online over watching TV. The survey also revealed that the favourite devices for children are smartphones (77%), followed by – for the first time at the second place – tablets (44%). Television (42%) has dropped to third place. The study run by the kid-centric digital media company also showed that 78% of kids watch TV content on digital devices. Over 80% of children surveyed said they find out about new toy launches and new television programs from the internet; only 50% said they get the same information from television. As indicated on their first research report, TotallyAwesome also noted that 90% of children as young as four and up to 16 are on social media e.g YouTube, Facebook or Instagram. It also showed the influence of online celebrities: three out of five parents claimed to have bought a product their child wanted because it was endorsed by an influencer and 50% of kids said they had asked their parents for something because it was associated with an online kid influencer. It’s no surprise that digital advertising triggers more action than television advertising. About 60% of kids said they had followed up on a product after seeing a digital advertisement. They had also asked their parents to buy the product and discussed it with their peers. When will advertisers align their strategies? Online usage has surpassed TV in the preference of children, viewing habits, device usage and impact. Despite overwhelming data, and even though the gap is closing, digital advertising spend in Asia Pacific remains below TV ad spend in the kids space. 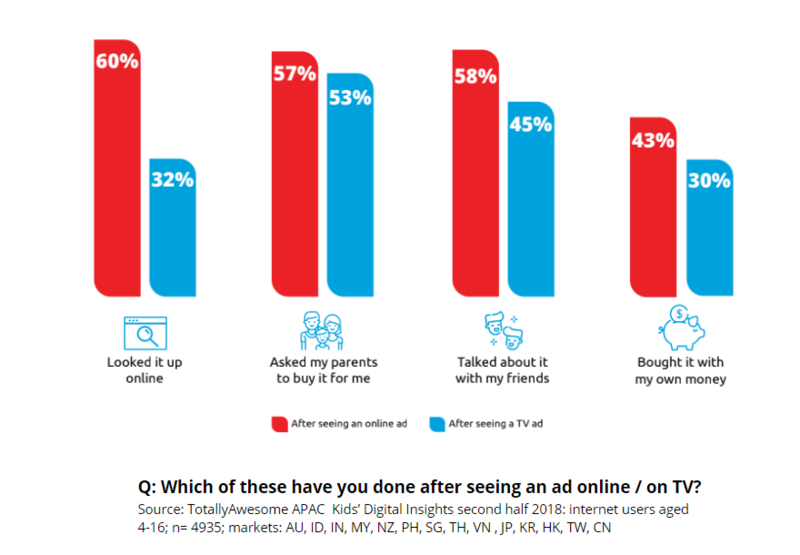 The TotallyAwesome APAC Kids’ Digital Insight was released in October 2018 and conducted across Australia, Indonesia, India, Malaysia, New Zealand, Philippines, Singapore, Thailand, Vietnam, Hong Kong, Japan, Taiwan, Korea and China. 4,935 internet users aged between four and 16 years old and their families took part in the survey.